The need to design a bamboo floor that shattered the stereotypes has arrived. Being strong wasn’t enough, this new floor had to be striking. On one hot New York City day, Stiletto was born. 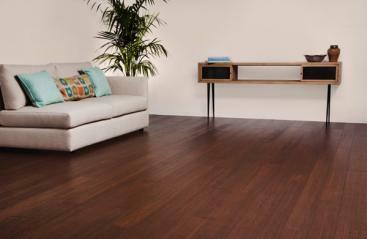 This floor takes bamboo flooring to the next level with its color, texture and style. Stiletto is commercial grade flooring, ideal for your business. Stiletto flooring is the toughest around. When this tough as nails floor is paired with PlybooFit for Retail underlayment system, incredible things happen. The system’s ¼” recycled rubber pad absorbs shock which will give your employees relief when in long-standing situations. Stiletto paired with PlybooFit for Retail subfloor system is a popular choice in salons, cafes, and retail establishments. Living in a condo or shared space? Stiletto is for you. Stiletto flooring is twice as strong as your old floor, and 5 times as stylish. Whether you like entertaining guests, have a family, or pets, Stiletto can stand up to whatever you toss at it. In multi-family living situations, we suggest pairing Stiletto with PlybooQuiet, an acoustic reduction subfloor system. PlybooQuiet absorbs the pitter patter of not so little feet, and all the knocks of your busy life.